Wedding Venues in North Carolina. The selection of wedding venues across North Carolina are endless and far-reaching. Because of our unique geographical makeup, couples have distinct options and styles afforded to them. Whether you’re looking for a cozy mountain venue with rustic romance and great outdoor amenities, or a private beach house big enough to host your whole reception, there are hundreds of options from which to choose. It's no secret barn weddings have shot up in popularity in recent years and North Carolina has many beautiful structures that serve as prime entertainment space. One of NC's rustic venues, Green Gables Farm in Statesville, opened in 2000 and features a barn, farm house, pastures, pavilion, donkeys, goats and more. Every barn venue is unique and offers a special experience, so be sure to do a site visit! If you’re in the market for something a little more contemporary, our bustling Charlotte and Raleigh wedding markets teem with artistic and industrial character. Art galleries, downtown warehouses and upscale restaurants have all opened their doors to the wedding industry in these major cities to provide just another option for getting married. For example, The Cloth Mill and Fearrington Village are two very different wedding venues. One features bold and industrial features, while the other offers historic characteristics. But just down the street, you can also savor open concept design in a venue like NOAH's event venue. And the coast is a popular destination for many couples both in and traveling to North Carolina. From top to bottom, our coastline features beautiful resorts and private homes perfect for any coastal wedding. It’s the idyllic atmosphere to say “I do” with a laidback, romantic flair. The Sanderling Resort in Duck features all-inclusive amenities to make your day as easy as can be. But you can also find private venues such as Neuse Breeze in Havelock that is literally as close to the water as you can get when it comes to oceanfront weddings. Because of unpredictable North Carolina weather, it’s always best to make sure your venue has both indoor and outdoor options, too. And due to the popularity of fall weddings in the Tarheel State, it's best to book early! 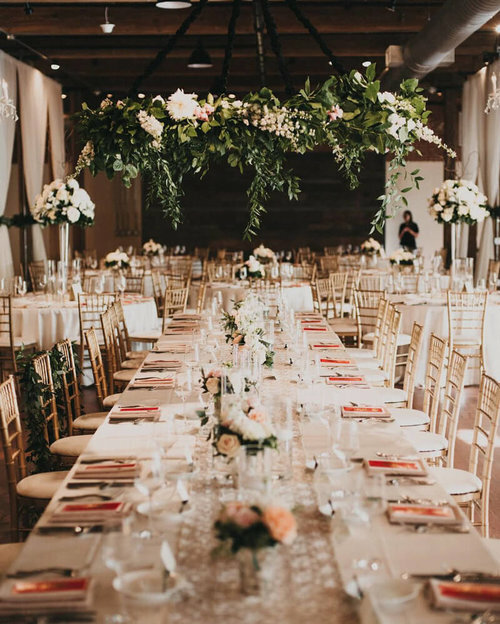 The amount of venue options can be daunting, which is why we've provided a list of North Carolina wedding venues on our vendor guide page.